You may remember Nipper as the creator of cs_gonehome, a CS:GO map that inserts terrorists and counter-terrorists into the previously machine gun-free setting of Gone Home. Earlier this month Nipper posted cs_wildrefuge, a map based loosely on the Malheur Wildlife Refuge, which six members of an anti-government militia occupied for 24 days before federal authorities intervened. Like the Gone Home map, shooting your way through the site of one of the most controversial news stories of the year reveals an odd mixture of comedy and discomfort. Intentionally or not, the map operates as political criticism, as satire, and simply as a casual siege in the style of cs_militia and thousands of others that have come before it. While the map isn't a 1:1 recreation of the real-life refuge, it's more detailed than you'd expect for something created in reaction to national news. I've recorded some footage in the video above; a snowy compound of closed buildings surround an interior, main building where the pair of 'bird watchers' are held captive beside couches and brochure stands. "A group of heavily armed patriots known only as 'Vanilla Isis' have decided to launch a rebellion against their tyrannical government! Using their brilliant tactical mind they chose their first target: a mostly unoccupied bird sanctuary and wildlife refuge. After about 2 days of holding this territory from the feds they have unfortunately run out of vital supplies like slim jims, energy drinks and beer. In an act of desperation for more supplies they have taken a couple of orange jumpsuit wearing bird watchers hostage. Now with human lives at stake the feds have been forced to respond." Supplies are running low. In the stash: apples, 'Sophia's' microwave dinners, fresh potatoes, vanilla drink, assorted juice. What a time to be alive, where we can where we can play out the political events of our time in team deathmatch as they're still happening. What would a CS:GO map based on the Boston Massacre look like? 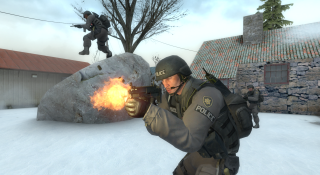 cs_wildrefuge isn't the first map modeled after a controversial event, of course—fy_abbottabad, a more authentic recreation of Osama bin Laden's Pakistan compound, was a well-circulated Counter-Strike: Source map in 2011. You can download cs_wildrefuge from Steam Workshop.